Maurice Goudeau began his career in 1993 as a mechanic and millwright. He was later promoted through the ranks and obtained the position of maintenance supervisor. When his Company was acquired by National Oilwell Varco (NOV) in 2008 Goudeau continued to be employed as a maintenance supervisor at NOV’s Conroe, Texas facility until he was terminated in 2011 at the age of fifty-seven. Goudeau’s new boss with NOV (according to Court the findings) allegedly repeatedly made negative comments about old people. He said Goudeau wore “old man clothes,” called him an “old fart,” and said a smoking area was “where the old people meet.” The supervisor also made a comment that “there sure are a lot of old farts around here” during a conversation in which he asked Goudeau about the ages of two other employees. After hearing their ages, he said he was going to fire them. The boss followed through on that statement and ultimately fired two of the three “old farts,” including Mr. Goudeau. He couldn’t fire the third only because he left the company for another reason. NOV claimed that it fired Goudeau because of his poor performance after written warning. Those complaints about Goudeau only started with this new boss after 18 years of a solid work record. Goudeau’s signature did not appear in the employee acknowledgement section of any of the last three warning forms. The final three warnings involved duties that Goudeau claimed were not his responsibility. And those written warnings sure were suspicious because all three warnings were signed by his supervisor on the same date even though the infractions supposedly happened on different days, according to the Court filings. None of the warnings were signed by Goudeau. The case later landed before the U.S. Fifth Circuit Court of Appeals which held that any ageist remark be proximate in time to the terminations, made by an individual with authority over the employment decision, and related to the challenged decision, and then those comments may only serve as sufficient evidence to allow a jury to find discriminatory motive if they are not stray, but instead are tied to the adverse employment action at issue both in terms of when and by whom they were made. Here they found the alleged “old fart” comments justified sending this age discrimination case to the jury. 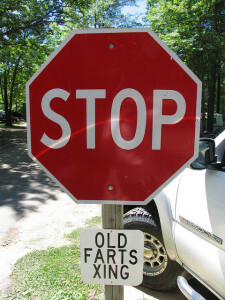 Common Sense Counsel: This case teaches employers four lessons according to my law partner Robin Shea who did a firm blog a few days ago on this case: 1) Don’t call your employee an “old fart,” especially if you think you may need to fire him someday; 2) don’t call his co-workers “old farts” right before you fire the co-workers; 3) don’t give your “old fart,” who has only a first-level warning on his record, three “progressive” warnings on the day that you fire him-that the employee has never been presented; and 4) don’t try to invoke “employment at will” to justify any of the above. Because the written warnings were unsigned, the court found them to be worthless evidence. Tommy Eden is a partner working out of the Constangy, Smith & Prophete, LLP offices in Opelika, AL and West Point, GA and a member of the ABA Section of Labor and Employment Law and serves on the Board of Directors for the East Alabama SHRM Chapter. He can be contacted at teden@constangy.com or 334-246-2901. Blog at www.alabamaatwork.com with downloadable written warning form.